The Indiana Hoosiers had given bettors little reason to trust them entering a road game against Michigan State. Naturally, not only did they cover as 14-point underdogs but they won outright cashing moneyline bets with 9/1 odds or better, 79-75. While scoring in the NBA is [rapidly increasing](https://www.betchicago.com/nba-scoring-increase-oddsmakers-keeping-pace), college offenses must've woken up this Groundhog Day on the wrong side of the bed. The temperatures outside in most of the country are cold, and so was the shooting in the 11 a.m. CT starts, as all three games involving ACC teams went UNDER their total, including an [almost unfathomable 47-24 win for No. 12 Virginia Tech at No. 23 N.C. State](http://www.espn.com/mens-college-basketball/game?gameId=401082755), which closed as a 3-point favorite. (The total was 151, so the teams didn't even get halfway there.) ## N.C. State's historic ineptitude on offense <a href="https://twitter.com/ESPNStatsInfo/status/1091772413329661952" class="embedly-card" data-card-width="100%" data-card-controls="0">Embedded content: https://twitter.com/ESPNStatsInfo/status/1091772413329661952</a> The Wolfpack (16-6, 4-5 ACC, 13-9 against the spread) shot 9-for-54 from the field (17 percent, worst in school history), including 2-for-28 from 3-point range (7 percent) and their leading scorer, junior guard C.J. Bryce, had seven points. N.C. State's football team scored less than 24 points in a game [only three times this past season](http://www.espn.com/college-football/team/schedule/_/id/152). The Wolfpack scored five points in the first 1:25 of the second half, and then just five the rest of the game, including only one field goal. Another crazy fact from this game is that the Hokies (18-3, 7-2 ACC, 13-8 ATS) had six of their last eight games go OVER, and they gave up 103 points at UNC less than two weeks ago. __MORE:__ [College hoops bad beat](https://www.betchicago.com/college-basketball-bad-beat-penn-state-purdue) Elsewhere in the ACC, No. 2 Duke cruised to a 91-61 win over St. John's as a 17-point favorite, but the total stayed comfortably UNDER the 162.5 total. Four straight Duke games have gone UNDER. No. 25 Florida State's 59-49 win over visiting Georgia Tech 59-49 was a semi-bad beat, as the Seminoles, 12-point favorites, attempted only four field goals in the final five minutes, missing them all, and the Yellow Jackets didn't foul as they dribbled the last 21 seconds off the clock. That said, Georgia Tech didn't score the last 4:21 of the game, as another went comfortably UNDER its total (135.5). ## Crazy second half in Memphis-South Florida game One of the early games that didn't go UNDER was USF's 84-78 win (the total was 150), as the teams combined for 111 second-half points. Memphis, which trailed 19-0 to start the game, had 13 in the first half but scored 65 after the break, including all 41 of senior guard Jeremiah Martin's points. USF, a 2-point favorite, never led by less than six points in the second half. __$10,000 up for grabs__: [Free to play Super Bowl 53 props contest](https://betchicago.chalkline.com/games/10k-big-game-blitz) ## Kentucky rallies from double-digit deficit to top Florida -- and cover Kentucky went on the road as a 3.5-point favorite against the Gators and covered, but it sure didn't look likely in the second half. Trailing by four at half, the Wildcats fell behind 42-31 with 13:18 left and Kevarrius Hayes at the line shooting two. He missed both, and as predicted on the broadcast by Dan Dakich, Kentucky went on a run. The Wildcats cut the Florida lead to 1 with a 10-0 run and eventually grabbed the 50-48 lead with 4:55 remaining. Eight free throws, three-point shooting and stifiling defense stretched the lead to more than enough for a 65-54 win and cover. 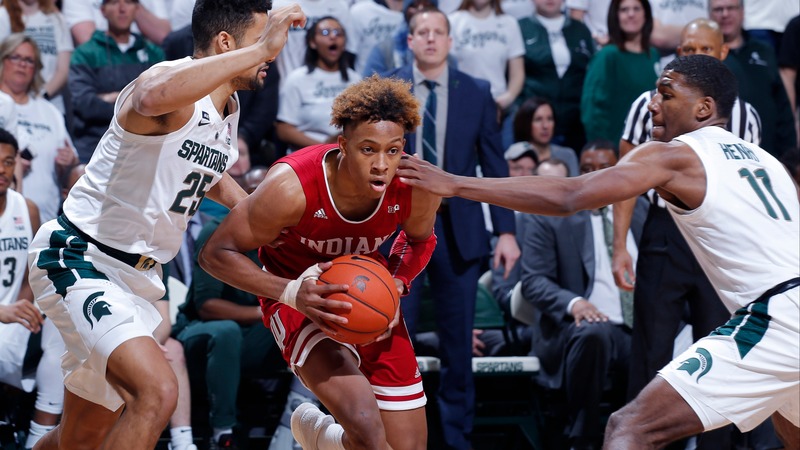 ## Indiana stuns Michigan State in overtime The Indiana Hoosiers had given bettors little reason to trust them entering a road game against Michigan State. Naturally, not only did they cover as 14-point underdogs but they won outright cashing moneyline bets with 9/1 odds or better, 79-75. Romeo Langford led the way for Indiana, especially after Juwan Morgan went down with an injury and did not return. Langford had 19 points, and his layup with 33 seconds left put Indiana up 66-65. Nick Ward made one of two free throws to tie it for Michigan State, giving Lanford a chance to end it. His step-back jumper missed horribly, giving the Spartans a chance in overtime. Four different players scored for Indiana in the overtime period and that was enough to fend off Cassius Winston's 26-point effort. Tom Izzo and Michigan State bettors will know exactly where to place the blame in this one. The Spartans finished just 8-22 from the free throw line. Ward was 1-9.